This Verde Queso Blanco Dip is the only cheese dip you’ll ever need. It is melty, creamy, and cheesy, with just the right about of spice! I could literally eat chips, salsa, and guacamole every day and never get bored. But, what really makes me happy is hot, melted cheese. There is something so comforting and soothing about cheesy dips. For me, dips make me feel especially happy when they have a little heat! You can’t open a bag of chips without serving up some Queso Blanco to go with them! This dip starts on the stove but finishes in the Crock-Pot, where it stays creamy and hot for as long as you need. This dip is made with three kinds of cheese and lean and healthy Greek yogurt. Adding Greek yogurt to recipes doesn’t sacrifice flavor, but it does add protein! White Cheddar and Monterey Jack cheeses work extremely well together in this recipe. The cheddar is tangy with a sharp bite to it, while the jack cheese is creamy and smooth. Cheese is the No. 2 source of calcium for Americans and it is the No. 1 food craving for Americans, beating even chocolate! I used canned chopped jalapenos and chili peppers. If you want to substitute fresh jalapenos, that would work, they would add a bit more heat and a fresh tasting bite. I added a few of my favorite spices, too, but they can be omitted if you prefer. When melting the cheese on the stove top, be sure to slowly add enough milk (whisking constantly) to make a creamy, dippable consistency. 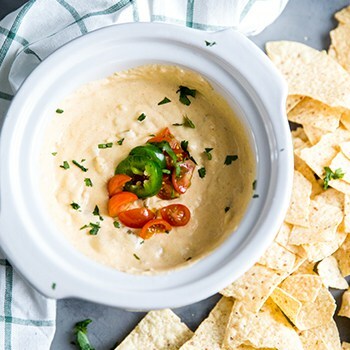 Whether it’s for Cinco de Mayo, tailgating, a holiday party or you just are craving some cheese in your life, this dip will exceed expectations and not last long. In a saucepan, whisk together the cream cheese, shredded cheddar, and jack cheese. Stir in Greek yogurt and garlic until mixture becomes creamy. Add spices, chopped chilies and jalapenos. Whisk in enough milk until mixture is smooth and creamy. Pour queso into a slow cooker to keep warm. Top dip with extra jalapenos and chopped tomatoes, if desired. 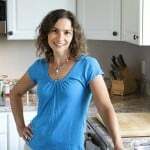 Tanya is the author, photographer and creator of Lemons for Lulu; a food and recipe blog where Tanya shares her love of cooking with her readers. Her blog is about no fuss recipes made with fresh ingredients. Simple meals that will put good food on the table fast so readers can spend more time with family.